The Moon Village Association (MVA) is a newly-formed nonprofit, nongovernmental organization, chartered in Vienna, Austria, comprising approximately 150 individual members from 34 countries worldwide that represent a diverse array of technical, scientific, cultural, and interdisciplinary fields intended to promote international discussion and formulation of plans to foster the implementation of a Moon Village. Its goal is the creation of a permanent global informal forum for stakeholder governments, industry, academia, and the public interested in the development of a Moon Village. The MVA fosters cooperation for existing or planned global moon exploration programs, both public and private. By creating regional, national, and international networks with other space and non-space organizations to engage civil society around the world, the MVA organizes dedicated events and workshops and makes the results available to the general public. The term “moon village” is relatively new, although the vision is ancient, dating back hundreds of years. Representing an overarching vision for the exploration, development, and eventual permanent human presence on the Moon, the concept of a Moon Village comprises not only near-term robotic orbiters, landers, and rovers discovering key facts about lunar surface features and materials, but also human sorties during mid- to long-term operations in the lunar vicinity and on the lunar surface, leading to human settlement of the Moon. In mid-November 2017, more than 150 scientists, engineers, entrepreneurs, educators, and students from around the world gathered at the permanent campus of the International Space University in Strasbourg, France, to participate in the first International Moon Village Workshop. 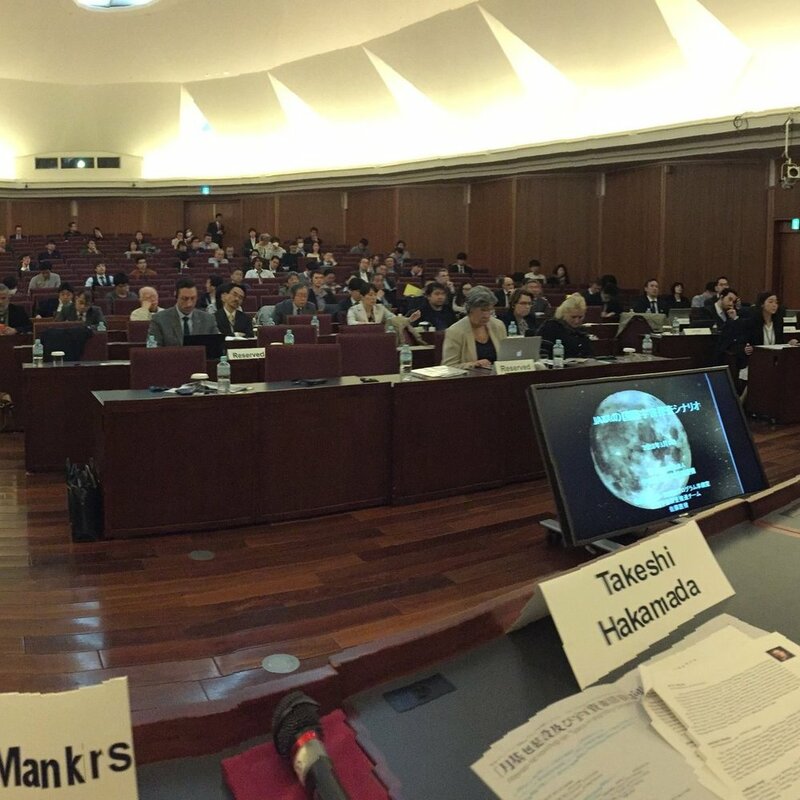 The two-day workshop resulted in two dozen Moon-focused presentations, as well as eighteen working sessions during which participants discussed topics ranging from the technical framework of the Moon Village concept, prospective government missions, and commercial markets for the Moon (including cis-lunar space), to future coordination and cooperation vis-à-vis the Moon Village, as well as ways in which human culture will influence choices and later be impacted by the expansion of humanity to the Moon. The consensus of participants was that the Moon Village concept has immense potential to broadly communicate an emerging focus on lunar exploration and development and activities throughout cislunar space (outer space in the vicinity of Earth and the Moon). The Moon Village is not a single location nor a traditional space project, but rather a broadly defined conceptual framework encompassing a diverse suite of planned and potential future human activities in space. Beginning now and continuing into future decades, the Moon Village will represent a community comprising a wide range of future missions and emerging markets, including scientific research, commercial ventures, profound cultural developments, and more. A landmark event, the Moon Village Workshop attracted policymakers, technologists, and scientists from diverse space agencies, engineers, and planners from major industry players, entrepreneurs from start-up companies and investors, and more than four-dozen faculty and students from diverse universities. Collectively, this diverse gathering of Moon Village visionaries included participants from Austria, Canada, China, England, France, Germany, Italy, Japan, Luxemberg, Russia, South Korea, Sweden, Ukraine, and the United States. Participating organizations included Airbus, the Association of Space Explorers (Europe), Beijing University, ESA, the European Space Science Committee, For All Moonkind, the Luxemburg Office of the Director for Space Affairs, the International Space Exploration Research Institute, Ispace Europe, the International Lunar Observatory Association, ISU, JAXA, Lockheed Martin, Lunar Station, Mankins Space Technology, MVA, NASA, the Pacific International Space Center for Exploration Systems (PISCES), PTScientists, Pulispace, RUDN University, Spacebit, Team Indus, the Yuzhnoye Design Office, and other institutions. The results of the Workshop are available at https://moonvillageassociation.org, and will be presented at upcoming gatherings and technical symposia. Future events are currently being planned, with the second International Workshop scheduled in 2018 (location to be determined). Membership in the MVA is invited from individuals as well as organizations, including both small and large companies, universities, and government agencies. Moving forward, the Moon Village Association is also extending invitations to participate in a number of working groups that have been organized, focusing on Architectures, Markets and Missions, Cultural Considerations, Terrestrial Testbeds for Future Lunar Activities, and others.